It’s a dark superhero movie with less silly, campy moments. It’s shorter, most of the silly sequences are removed. This film now gives the Devil his due, in a matter of speaking. It’s a dark superhero movie with less silly, campy moments. * The opening scene of DD in the church is removed. The film begins with Matt in the court room with Quesada. * Origin story is spread out throughout the film and is much, much shorter. * The Matt/Elektra playground fight is a lot shorter and a lot less ridiculous. * The Kingpin’s hip-hop introduction is cut. * That horrible CGI shot of DD kicking Bullseye is a lot shorter. * That horrid Evanescence song is removed from the Elektra training scene. It is now replaced with “Session” by Linkin Park, which fits the sequence very well. Before everyone moans about Linkin Park, this song is instrumental. * Most of Matt’s voice overs are removed, except for the stuff towards the end. * This is kind of trivial, but it always bothered me: When Ben Urich hits delete on his keyboard to erase his story, he taps it once and erases the whole story, rather than holding it down. I have now changed it so it looks like he holds the button down. It’s stupid, but it always annoyed me. * A few little cuts and trims and re-ordering of shots, to keep the pace and make everything work. I'm a little more unfamiliar with Daredevil and the characters in his portion of the Marvel Universe, but I've read enough stories with Elektra (Thunderbolts Now!) and Deadpool that have featured the blind crimefighter in some way or another. Anyway, having not seen the original due to hearing how awful it was, I desperately looked for Uncanny Antman's Daredevil but infamously was unable to find it, so when I found Spence's edit I was thrilled. Based on the changes made and other edits, I think this made for a much stronger movie than the original. Considering we will see Afleck take on the role of the World's Greatest Detective in just a few years, I really wanted to see if he had the chops for a very physical but serious role as a superhero. Based on what I'd heard, I just kind of assumed that Ben Affleck was the problem with Daredevil, and this edit in particular has convinced me that I was mistaken. Don't get me wrong, even with all the edits here this movie is still fairly ridiculous (but so much better than I imagine it was), mostly due to the (much more tame) dialogue but also because of the (thankfully much shortened here) church organ pipes fight scene. It's strange to me that with all this quality star power (with the exception of Favreau, he's a much better director than actor, though the same could be said of Affleck) that this movie turned out the way it did. Jennifer Garner proved she's got chops on Alias, and Colin Farrell has done great serious and comedic movies. Even Michael Clarke Duncan (RIP) is a great dramatic actor who really gave it his all in The Green Mile. Regardless of all that, this edit found something in this movie that I think got overlooked by audiences in 2003 when it was in theaters. Sure all the cheese wasn't removed, but this edit definitely makes this movie feel a lot meatier overall. Spence tweaked the recipe enough so that this movie feels more like steak with some cheese instead of cheese with some bacon bits sprinkled on top in an attempt to give it some crunch. 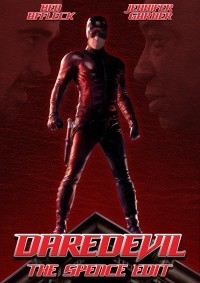 While I'm not sure if I would recommend Daredevil as a movie to most people, if someone was interested in the Man Without Fear, I would highly suggest they check out the fine work Spence has done here, which absolves a lot of what made this movie so unlikable in the first place. Spence's re-emergence on the forum to reveal plans of a second Daredevil edit, as well as Uncanny Antman's reveal that he too was working on an edit of the film, inspired me to revisit the director's cut of the film, as well as Spence's first Daredevil edit. I hadn't watched either cut in years so it was nice to watch them both so close together. The director's cut is definitely the better of the two official cuts, but there are still some problems with it. Spence's edit attempts to rectify this, and does so, but only to a certain extent. There are still some moments I would have liked to have seen gone, but it's a step in the right direction. The video was perfect, except for one instance. During the transition from the scene with Matt in the sensory deprivation tank, to the scene from his childhood when he's blinded, there is a very brief instance of artifacting. It only lasts for a split second, but it is noticeable. The audio was good, but loses some points for being 2.0 instead of 5.1. The editing wasn't bad, but there were several places were it was obvious that stuff was cut or rearranged. It could also be because I watched the director's cut yesterday and this edit today, so I was more aware of what should go where. Some of it is also due to the low background audio seeming to end abruptly in some instances. It's not really that distracting though. Aside from the audio issue I mentioned above, which I really consider more of a visual editing issue than an audio one, there were a couple of times where the audio completely cut out. During both instances though it was right after something was said, so nothing was really lost, but it is really noticeable and kinda distracting. The only other audio issue I have is with the replacement of the Evanescence song during Elektra's training montage. The new song that was used, an instrumental by Linkin Park, just doesn't gel with the scene. And while I was watching that scene I couldn't help but feel like the tv was on mute and the song was playing on the stereo. Nothing's changed in regards to the story so I guess I'd give this a perfect score. I'm one of the people who actually loves the movie. I saw it opening day, bought the 2-disc theatrical cut on DVD, the director's cut on DVD, and the director's cut on Blu-Ray. Since the director's cut was used as the source I'm going to compare it against that cut. For me the director's cut is an 8 out of 10. It would have been a 10 out of 10 if they hadn't included the origin story, cut some of the "humor" that's still present from the theatrical cut, and various little bits that bugged me. Now obviously they couldn't get rid of the origin story since this is Daredevil's first film, but they should have been able to get rid of the lame jokes and over-the-top moments that are standard in your run of the mill superhero movie. Daredevil isn't your typical superhero though, he's your average everyday guy, who just happens to don a costume and fight crime at night. He's a dark and serious character, basically Marvel's answer to Batman, and he deserves a more grown up film. For the most part Spence didn't make any big changes, mostly trimming bits here and there, trying to make the film more serious. Unfortunately though he decided to leave some the of the "humor" intact. The biggest offenders being the scene with Bullseye on the plane and the scene at the end when Bullseye kills a fly. What he did that I loved though was start the film during Quesada's trial instead of starting with the origin story. The origin story has been severely trimmed down, and split in two parts, which are shown as flashbacks. While I appreciate that he really cut down on the origin story I would have preferred if he had cut it out altogether. Despite leaving some of the "humor" intact, and not getting rid of the origin story completely, I'd have to say that I did enjoy this cut more than the director's cut. But only slightly.